Special Counsel Robert Mueller’s probe of Russian meddling in the 2016 US election is close to wrapping up, according to Acting US Attorney-General Matthew Whitaker. “I’ve been fully briefed on the investigation and I look forward to Director Mueller delivering the final report,” he said at a press conference on US charges against China’s Huawei Technologies. Mr Whitaker’s comments mark the first time a top Government official with knowledge of the investigation has publicly confirmed the probe is in its final stages. Media outlets have reported that Mr Mueller’s office could be close to issuing a final report on his investigation. But Mr Mueller has been tight-lipped about when the months of closed-door grand jury sessions and criminal charges will conclude, leaving questions over how far into the White House his probe will reach and what will happen to his findings. Mr Mueller’s investigation most recently ensnared a long-time confidant of President Donald Trump, political operative Roger Stone. Others in Mr Trump’s orbit have also been charged in the probe, including his former campaign manager Paul Manafort, his former campaign deputy Richard Gates and his former national security adviser Michael Flynn. Mr Trump’s nominee to fill the attorney-general post permanently, William Barr, recently pledged to make public as much of the report as possible, saying Mr Mueller is required to file it confidentially. But Mr Barr has declined to pledge to release Mr Mueller’s report in its entirety, saying that some portions might need to remain confidential, such as decisions not to charge certain individuals. Russia denies any wrongdoing in the 2016 election. Meanwhile, Mr Trump’s former lawyer Michael Cohen, who pleaded guilty to crimes including campaign finance violations during the 2016 election campaign, will testify next week at a closed hearing of the US House Intelligence Committee. Cohen had postponed an appearance before another congressional panel citing threats against his family from Mr Trump. “I want to thank Michael Cohen for agreeing to appear voluntarily before the committee for closed testimony on February 8,” Democratic Representative Adam Schiff, the panel’s chairman, said in a statement. “Mr Cohen has relayed to the committee his legitimate concerns for his own safety as well as that of his family, which have been fuelled by improper comments made by the President and his lawyer,” Mr Schiff said. Last week, Cohen cited threats from Mr Trump for postponing testimony before an open hearing of the House of Representatives Oversight Committee set for February 7. That hearing has not been rescheduled. Cohen, who is set to go to prison in March, was subpoenaed last week by the Senate Intelligence Committee to appear in mid-February. In December, Cohen was sentenced to three years in prison for crimes including orchestrating hush payments to women in violation of campaign laws before the 2016 election. 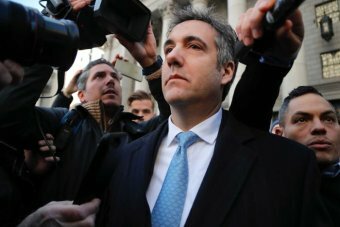 Cohen said in the guilty plea that he was directed to make the payments by Mr Trump. The President and his lawyers have argued the payments were a personal matter unrelated to the election. Mr Trump called Cohen a “rat” in a tweet last month for cooperating with prosecutors. Cohen had been Mr Trump’s self-described longtime “fixer” and once said he would take a bullet for the New York real estate developer. In a Fox News interview this month, and other forums, Mr Trump also suggested he had damaging information on Cohen’s father-in-law. What happened to Sarah Huckabee Sanders?